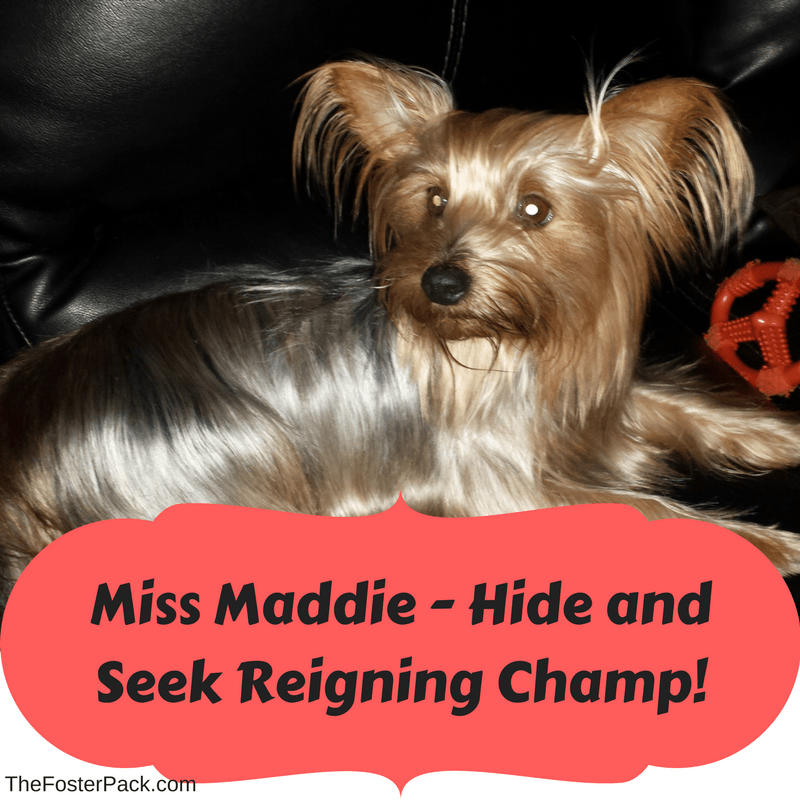 Maddie – Hide and Seek Reigning Champ! That’s currently the most asked question in our house. And then the search begins. Her favorite place is under the big leather sectional in the family room. Specifically under the middle section, between the recliners on the ends. A heavy piece of furniture, that is almost impossible to move, without a few strong men, due to the fact that the two pieces lock together. She pulled down the bottom liner and climbs up inside. So now the back of the couch is surrounded by baby gates to keep her out. The other day she disappeared, we spent half hour searching for her frantically. I really thought that she had somehow escaped the house, although I couldn’t figure out how. No windows were open, and I had seen her since the doors were opened last. Sister went outside to look, taking Chewy, Maddie’s favorite foster sibling, and the reigning “Bring her back” champ, to help. I headed back to my recently rearranged office. And saw movement in the corner, between my printer desk and a set of drawers. A corner too small to do anything with, and containing a heat vent. I stuck the laptop bag and doors to always open crates back there to keep them out of the way. There she was, all curled up in a tiny little ball. Even Cami, the puppy, hadn’t found that corner yet. But Maddie had. I moved the drawers, got her out. And added that spot to my mental list of places to look for Maddie. It’s getting to be a long list. We seem to spend a lot of time on our hands and knees crawling around looking for her. Even Cami, the puppy, hadn’t found that corner yet. But Maddie had. I moved the drawers, got her out. And added that spot to my mental list of places to look for Maddie. It’s getting to be a long list. We seem to spend a lot of time on our hands and knees crawling around looking for her. She certainly seems to like very tight spaces. Yet she flips out when you try to put her in a crate? Our dogs love their crates, some of them don’t even need doors on them to keep them in. And they’ve never bothered with going under the furniture. Maddie certainly is one of the most entertaining foster dogs we’ve had yet. The house is going to seem a whole lot quieter, and less exciting when she gets adopted. On a good note, she has finished her medication and is now officially available for adoption. Maddie is a 5 yr old Yorkie. 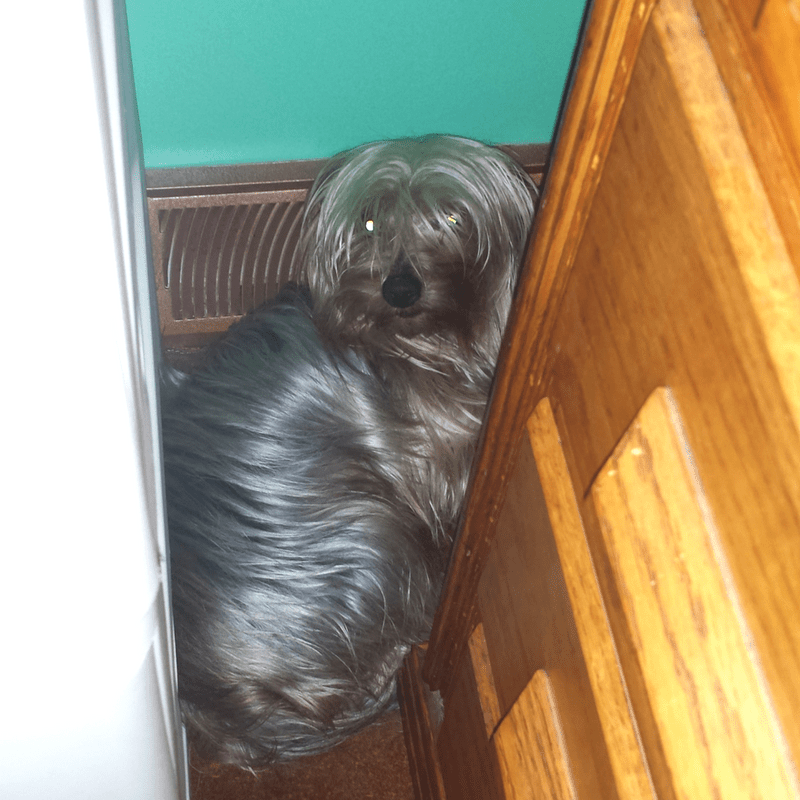 Does your dog like to hide in weird places?